Bexhill United manager Ryan Light said the football club’s admirable display in a midweek cup defeat will boost confidence as it returns to league action. The Pirates will return to Southern Combination League Division One action with a trip to Littlehampton Town tomorrow (Saturday) having being edged out 1-0 at home to higher grade Burgess Hill Town in the Sussex Senior Challenge Cup on Tuesday night. Speaking after that match, Light said: “It certainly won’t knock us off our stride, it will give us more confidence going into our league games. “If you lose three, four, five-nil to these teams, it feels like a defeat. But when you lose a narrow 1-0, it doesn’t feel like a defeat. 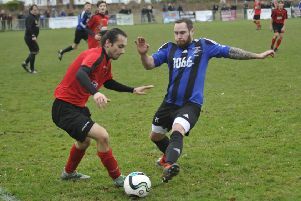 “It just spurs us on to go into Saturday’s huge game at Littlehampton. It will be a really difficult game, but we’ll hopefully come back with a positive result. Bexhill are second in the league - three points behind leaders AFC Varndeanians - and possess the best goal difference and most prolific attack. “It’s now time to knuckle down and focus on what’s important to us this year - and that’s the bread and butter of the league programme,” added Light.